This version of Malai Kulfi is a quick one - thanks to the use of condensed milk and milk powder. Do check it out. As promised I am back with another recipe for Kulfi. Unlike the Cardamom Kulfi I had posted earlier, this one is much quicker excluding the freezing time and yet no compromise on taste. I had bookmarked this recipe long back from Tarla Dalal site and tried it a few days back. What makes it quick is the use of condensed milk and milk powder. It has a melt in the mouth texture and I am simply bowled over by the simplicity of the recipe. This recipe is a keeper as it is quite effortless. I used the exact measurements as given on the site and got 6 kulfis (80 ml each) + extra (about the measure of 2 kulfi) which I froze in a freezer proof bowl﻿. You can enjoy this malai kulfi by itself or serve it with falooda and rose syrup. Perfect to beat the heat. I know it is just an excuse for me as the summers here in Ireland are not like the one in India as the temperature here once in a while crosses the 23 C mark. Still, I do indulge in the cold treats! 4 green cardamom pod seeds finely powdered. 1. Combine all the ingredients together and bring to a boil. Add the powdered cardamom. 2. Simmer for 10 minutes on medium heat and turn of the gas. Cool completely. 3. 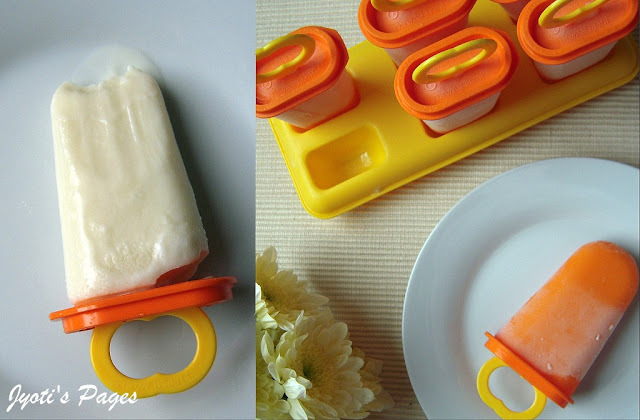 Pour into kulfi moulds and freeze overnight till firm. Depending on the size of the moulds, no. of kulfis might vary. 4. Allow the moulds to remain outside the refrigerator for 5 minutes and then unmould it or run hot water over the kulfi moulds to unmould it even quicker. 5. Enjoy it on a hot day! Linking it to Serve it Chilled and to PJ's Kids delight Cool Comforts Event. This event is the brainchild of Srivalli. Hey dear first time here..u hv a bful blog with stunning pics..hope to hear a word from u too. Kulfi is my fav fav,n this looks deliciousssssss ..any leftovers pls.?. That's one super cool and easy to make kulfi. Love this. Beautiful and fresh pics. Kulfi looks so tempting and beautiful photos, Jyoti. Cool. I usually don't put it in the popsicle mold since it is too much per serving. I normally don't hv milk powder at home so can I omit it & use rest of the ingredients... Pls help..
Ritika - milk powder is a vital ingredient here. Not sure if you can omit it :(. However, if you do try let me know how it turns out.